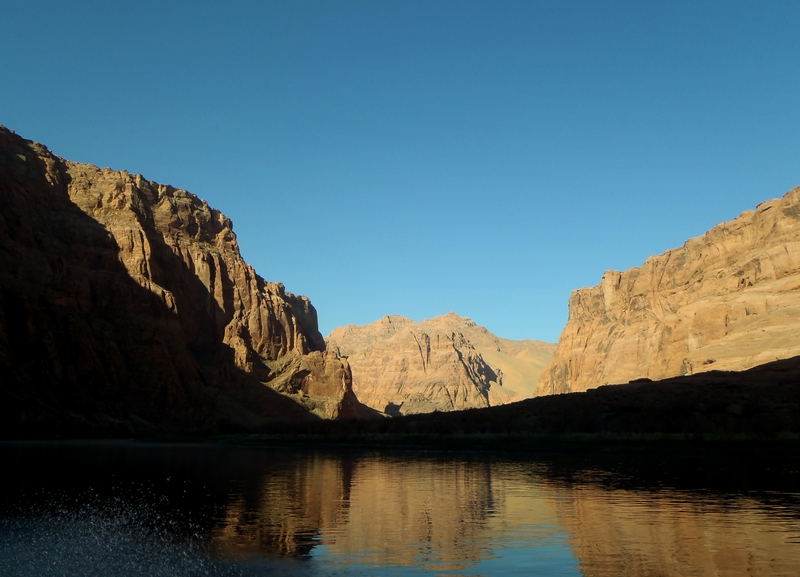 Lees Ferry is a tremendous fishery located in northern Arizona on the Colorado River above Grand Canyon. 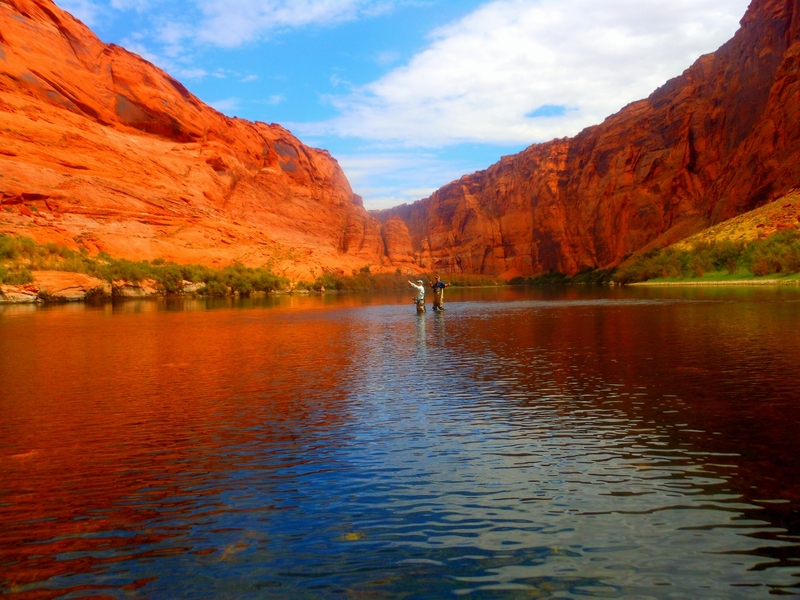 Created with the completion of Glen Canyon Dam in 1963, this tail water is crystal clear and a constant 47 degrees, providing anglers with an exceptional fishing opportunity 365 days a year. 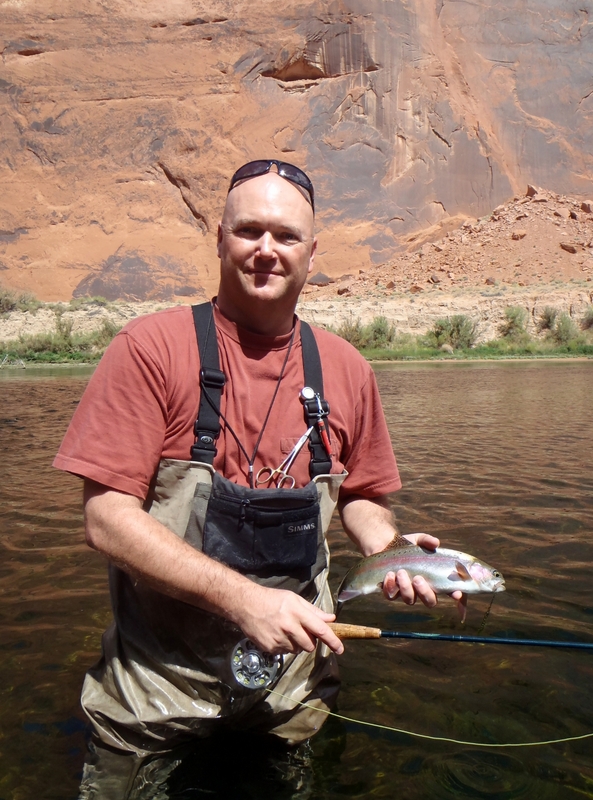 The river here is managed as a trophy fishery by the Arizona Department of Game and Fish anglers can expect rainbows averaging 14” to 18” with a good chance at fish of 20” or better. 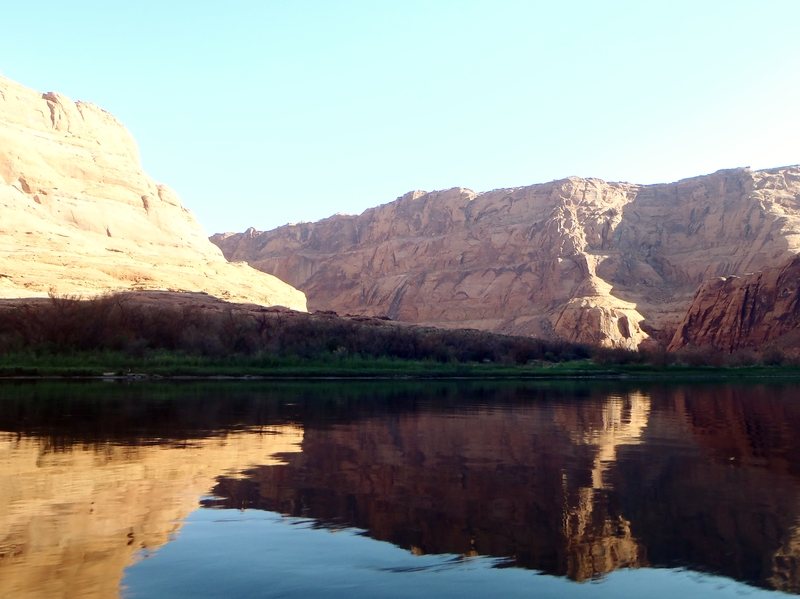 This stretch of the Colorado is accessible only by boat, guarded by the 700-1500 foot red sandstone cliffs of Glen Canyon. This and the nature of the river, that is shallow riffles and gravel bars interspersed with deep un-flyfishable water, insure a feeling of having the place to yourself. Its been awhile since I made it up to Lees Ferry for a weekend fishing trip, at least 5 years. We get so busy in our lives obtaining more and more hobbies that we tend to forget about the things we really enjoy. So remembering how much fun I had, I asked the cave-woman if she wanted to go, as you see,I scheduled the trip. 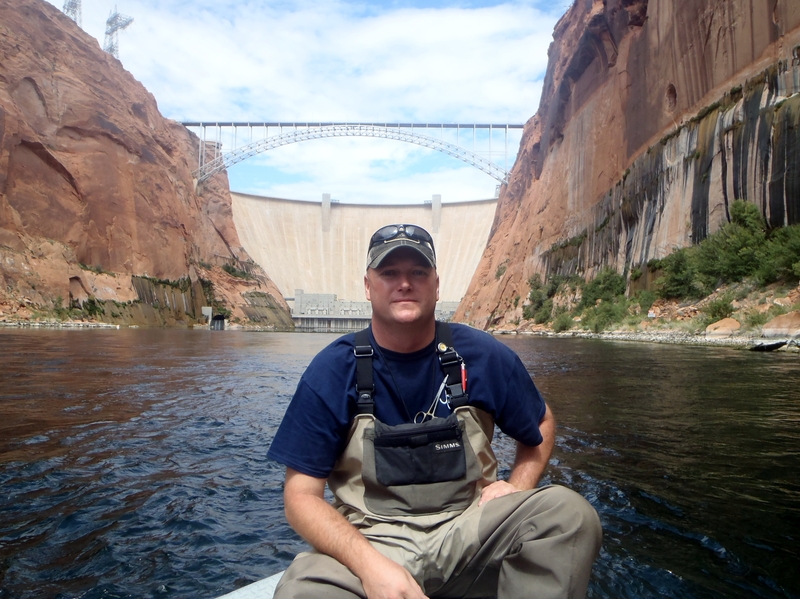 I prefer to book with Marble Canyon Outfitters as they are a family run business who have lived in the area and fished the river for generations. 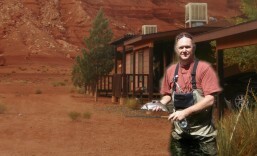 They are predominantly a Fly Fishing Guide Service which is a great fit for me. 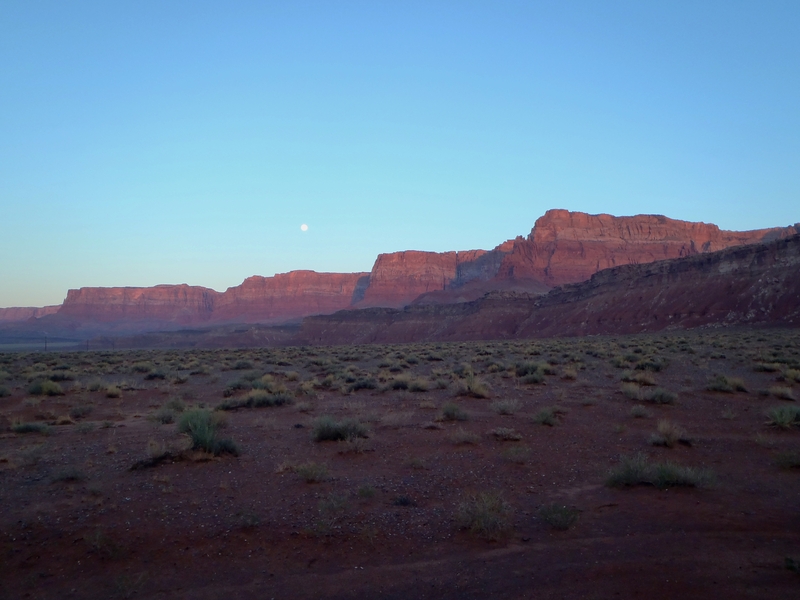 There are a few options for lodging, but I prefer to stay at the Marble Canyon Lodge, it’s the closest to the river, has options for staying at the motel, or they offer small apartments for rent. The lodging is rustic at best so don’t expect anything fancy but for a weekend of fishing its perfect for us. The motel has a small gift shop, gas station and restaurant on the property for dining and minor needs, the town of Page is also about a 45 minute drive away. Being that I’m the Cooking Caveman I always prefer to stay in a condo, apartment, or a room with a kitchenette, this allows me to do my thing and cook the food I want. Restaurant’s are fine, but not everyday? The apartments are basic but contain the essentials you would need for a 3-4 day weekend. You enter into a decent sized living room which has a good size kitchen in the back, sorry I didn’t get pictures. The kitchen was stocked with the bare essentials, fridge, stove, microwave few pots, pans, dishes, silverware and glassware. Down the hall was a guest bathroom and then two good sized bedrooms with 2 double beds. One of the bedrooms did have a half bath in it. Outside of the unit was a small porch and metal charcoal BBQ. For a weekend like this I put together a basic menu, just a few items that I can cook on the BBQ. Even though there is a kitchenette, you can’t always count on them having working items, like an oven or sharp knife which I learned quickly, but being that I’m the Caveman I always come prepared, my handy fishing knife, after it was cleaned worked great. 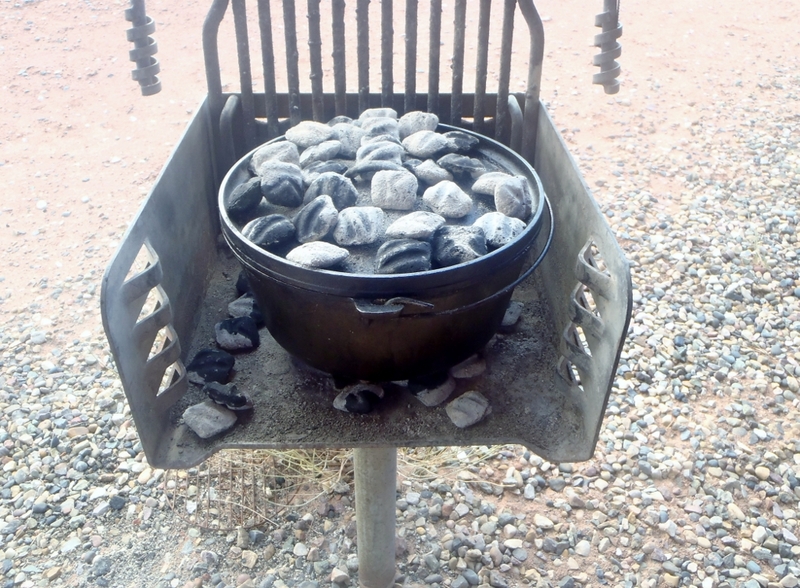 We are not going to go into recipes but I do like to bring a dutch oven and at least one cast iron skillet, this allows me to cook the basics, with the cast iron and the BBQ I’m covered. I make quick breakfast burritos in the morning, and dinners can be anything from green chili and swiss burgers to stuffed pork chops and potatoes, both are in my recipes. I will typically put together a menu the night before, load the ice chest and grab some groceries on the way. Don’t forget the beer! I have to say waking up to this view on our way to the river just made the day that much better. 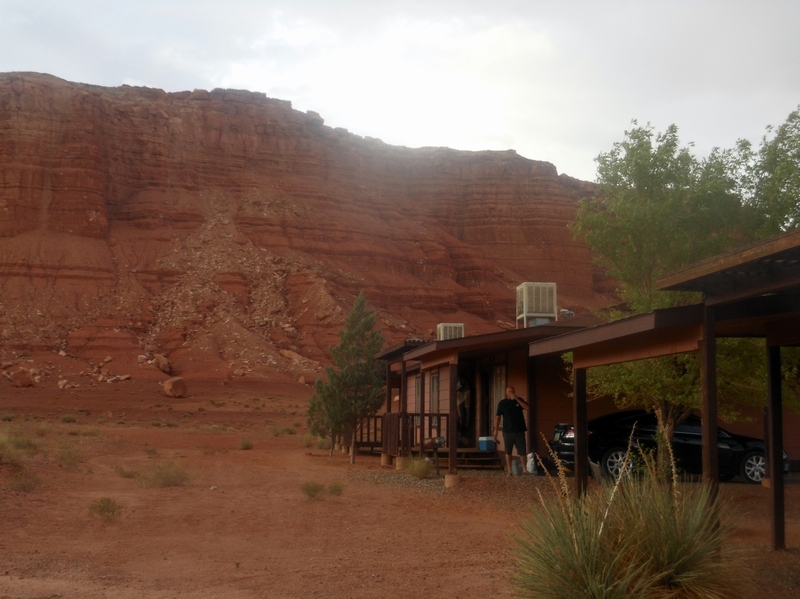 It’s just a quick 10 minute drive down to the river where you have great views of the red rock cliffs and balancing rocks. We get down to the river and to our surprise our guide wasn’t there, unfortunately being the “CAVEMAN” I didn’t read or bring the reservation form and we were supposed to meet Mick our guide at the lodge not the dock. So after a quick call the mix up was corrected and we meet up with our guide. Fortunately Mick was very understanding and we were on our way up river to do some fishing. The views up river are amazing, the pictures do not do it justice. The water was like glass with a small mist in some spots. On the ride up river while I was setting up our gear, Maria (aka cavewoman) was able to take some nice pictures. We settled in at one of the first spots Mick wanted to try, Duck Island. Mick set up our rods with a nymph fishing rig and pointed me in a direction, off I went. I headed to the back side of the island and fished the riffle that he pointed to. 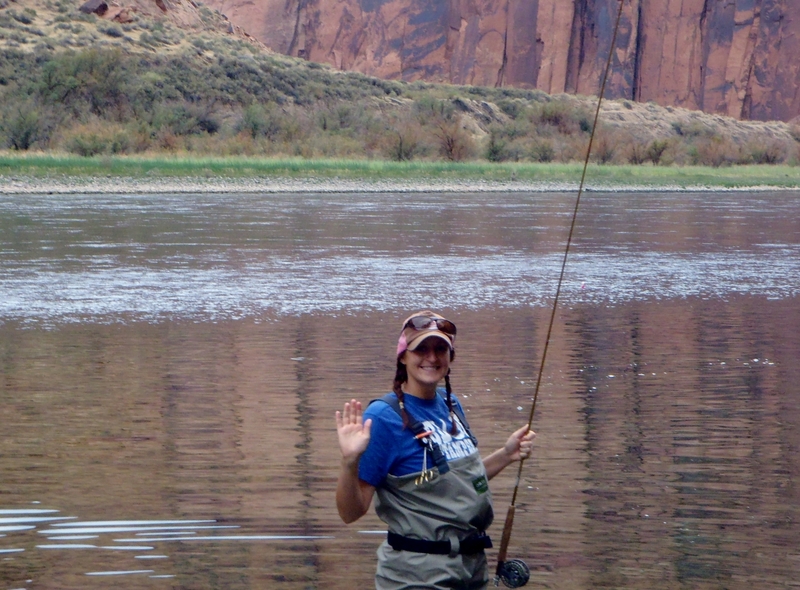 The cavewoman is new to the fly fishing scene, I thought this would be a great experience for her to work with a professional guide. I will have to say Mick (Owner) was great, he showed extreme patience while working with her, she picked it up quickly, had a great time and caught a lot of fish which allowed me to have that peaceful experience on the water just doing what I enjoy. After spending a little time with the cavewoman showing her some basics and helping her get started he headed over to see how I was doing, by that time I had caught a few but nothing special. Mick gave me some pointers and showed me a better part of the riffle to fish, then headed back over to work with Maria. Every-time Mick came back to check on me he would give me an update on how the cavewoman was doing and to my surprise she was doing well with a great average on the size of fish she was getting, all in the 14-15″ range. Unfortunately where I was fishing I did get a few in the 15-16″ range, most averaged in the 12-14″ range. Not good for Caveman! We continued to fish throughout the morning catching incredible numbers, I would easily estimate that by lunch I had caught anywhere from 20-30 rainbows. 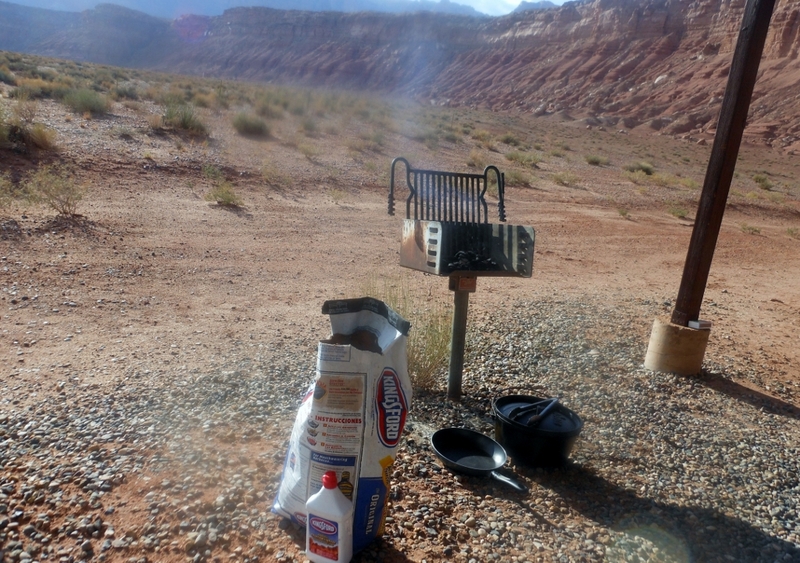 By eleven we broke for lunch which was supplied by Marble Canyon Outfitters, it definitely hit the spot. It included a sandwich, potato salad, some fruit and a very large cookie. At that point the cavewoman and I decided it was time to break out the beer, that cold Coors Light tasted so good after a busy morning of fishing. We continued fishing Duck Island after lunch being the fishing was so good. I moved to the front side of the island after lunch so I could fish close to the cavewoman. I have to say I expected the fishing to slow down after lunch but that was far from the truth, we continued to fish the deep water nymph rig and continued to slam them. By the end of the day it was to the point my shoulder was hurting from catching so many fish. We easily had a combined catch of 70 – 90 fish for the day. Now that’s a great day. As the day ended we pack up and a typical afternoon thunderstorm rolled in, perfect timing as we were heading back. I welcomed the storm as it dropped the temps from the 90″s into the 80’s. We got back to the dock grabbed our gear and headed back to the lodge. The thunderstorm only lasted about an hour which is typial for an AZ fall afternoon. It let up just in time to start the BBQ, and enjoy another few beers. We got up the next morning to another beautiful view and headed for the river to meet up with our guide. When we reached the river there was Mick, in the boat and ready to go, my kind of guide. We were first on the river… Most of the other guides were just putting there boat in the water. First on the river means first choice of the fishing spot. The second day we tried other spots along the river which was perfect for us, the experience is not only about catching a lot of fish but experiencing the beauty of the river and the ama zing surroundings. The fishing was a little slower on the second day, the thought on that was the flows from the dam were reduced by half and this was the first weekend this happened. Either way this did not deter our guide Mick, he was constantly changing fly’s, depths, set ups and locations. Now I really can’t complain because when I say the second day was slower I am comparing it to the amazing numbers from the day before. Even on the slower day we still finished the day with 30 -60 fish between cavewoman and I. One thing I really liked is that since were were quite aways up river, Mick asked us if we wanted to see the Dam and of course we did. I have to say its incredible. 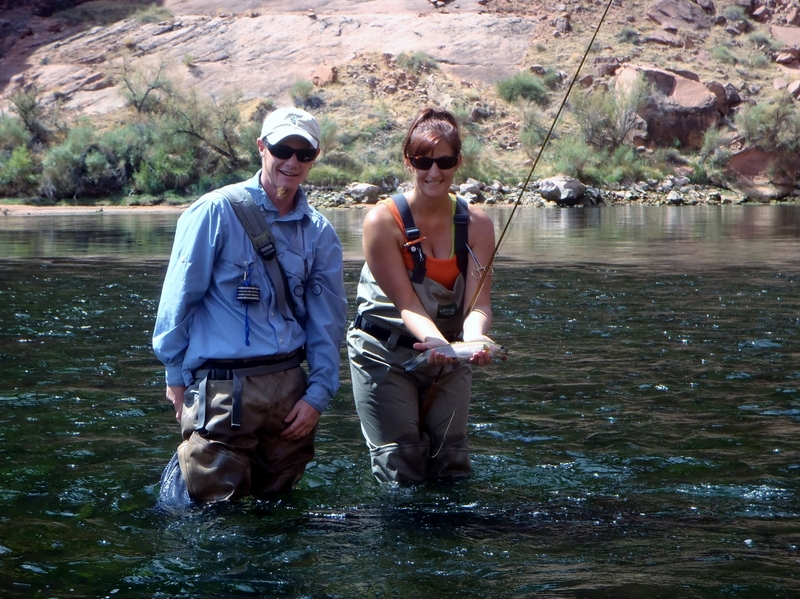 We headed back to the dock and regrettably ended an amazing two days of fishing the Colorado River at Lees Ferry AZ. We parted ways with Mick and let him know that we will definitely be back then headed back to the lodge. Let me say the BBQ was easy that night but the beers were definitely flowing. After two days on the river and roughly 80 rainbow trout on the rod, my body was definitely tired. I hope you enjoyed my post on Lees Ferry I definitely look forward to many more with my Cavewoman.